When Stanley Nelson agreed to discuss his new op-ed documentary on HBCUs’ strained relationship with the Trump administration, I struggled to find the terms to describe him. Simply calling Nelson a “filmmaker” seemed inadequate. Referring to him as the premier documentarian of the black experience seemed a little hyperbolic (not to mention that it contained too many syllables). I finally decided that “storyteller” was an apt description to describe the man whose filmography ranges from 2013’s The Story of Emmett Till to the acclaimed 2015 documentary The Black Panthers: Vanguard of the Revolution. His latest short film, Black Colleges in the Age of Trump, examines how the current presidential administration has used HBCUs to further its political and social agenda. Created in conjunction with the New York Times Op-Ed Docs, the “op-doc” reflects on the importance of predominantly African-American institutions of higher education in both the past and future of America. The 12-minute digital short also serves as a preamble for Nelson’s highly anticipated feature-length project, Tell Them We Are Rising: The Story of Black Colleges and Universities, premiering on the critically acclaimed PBS series Independent Lens on Feb. 19. Nelson explained that both documentaries are the results of his personal and professional pursuit to share these untold stories that are not just part of black history, but American history. From Talladega College’s participation in Donald Trump’s inauguration to Betsy DeVos’ Bethune-Cookman commencement caper, Black Colleges in the Age of Trump highlights how HBCUs have served as a symbol of the Trump administration’s treatment of black America in general. It examines the implications of inviting black college presidents to the White House and DeVos’ tone-deaf referral to black institutions as examples of school choice. You also can’t underplay the effect of outlets like Fox News, where people can say: “No, no, no, the sky is not blue, the sky is red. Trump didn’t call those countries a shithole,” when everybody clearly heard it. Look at it this way: When Richard Nixon was being prosecuted, hounded and chased down for Watergate, there were no news channels that you could turn to that would say, “Oh, no, no, no. That didn’t happen. He didn’t break into Watergate. Everything is all right.” That didn’t exist. There is only one set of facts. While agreeing that HBCUs are in perpetual danger, Nelson said that there will always be a need for historically black colleges, thereby ensuring their future existence. Although they might be fewer in number, they will ultimately survive as they have for more than a century and a half. 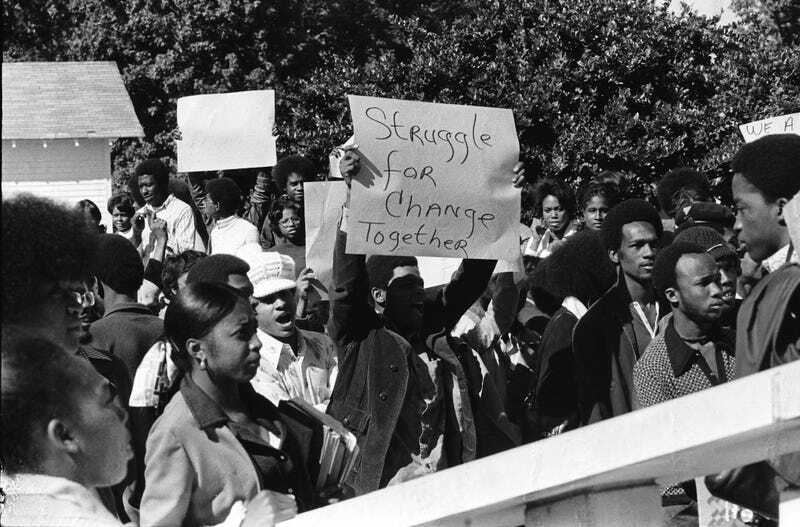 Tell Them We Are Rising: The Story of Black Colleges and Universities airs Monday, Feb. 19, at 9 p.m. ET (check local listings) on PBS on Independent Lens.